As an entrepreneur of a start-up, you are a dedicated person having a never give up spirit. You wish that every facet of the business should be perfect. Having those qualities, you tend to take on more than what you can handle. Then comes a time when the business booms and you have to consider IT outsourcing. According to a Gallup report, 46% employees work remotely in US alone. IT outsourcing is not a new business strategy and has been practiced across the globe for the past few years. A few companies rely on a single service provider while other choose multi-sourcing. The globe has skilled people that can make your business better. So, hiring a remote development team is worth the investment. How do you manage that long distance relationship with your employee? Collaboration is possible only with successful communication between the employer and the remote worker. Time when the team prefers to communicate (regular meetings, certain days, preferred timings). Don’t forget the time-zone scenario. Humans are unpredictable, and generalization is not possible. The biological clock of every person functions in a different manner. But there are certain assumptions based on surveys and Q&As. For example, tasks that need peak productivity should feature in mornings. While less significant tasks are suitable for midday slot before the break. The creative work and thought demanding tasks are best suitable for the afternoon. In this way, there is a proper division of work assigned to a remote worker into various sections. There maybea possibility that your remote employee can be following a different schedule for the entire day. Making the work employee-oriented is much more helpful than making the employee work-centric. If the business is not systematic, it may fall apart. An in-house team can look over each other’s shoulders but in a remote team this is not the case. In on offshore development team, every person can be in their own world. They develop their procedures that doesn’t mesh with that other members working. It is great thing to have a documented, standardized way of working that you refine constantly. Whenever you feel the need to train your remote employee, make sure you go ahead. Do as much as you can to make them understand the work culture, get them adjusted and make then learn how to perform their role efficiently. If required, let your in-house team member who is experienced train the remote developer. 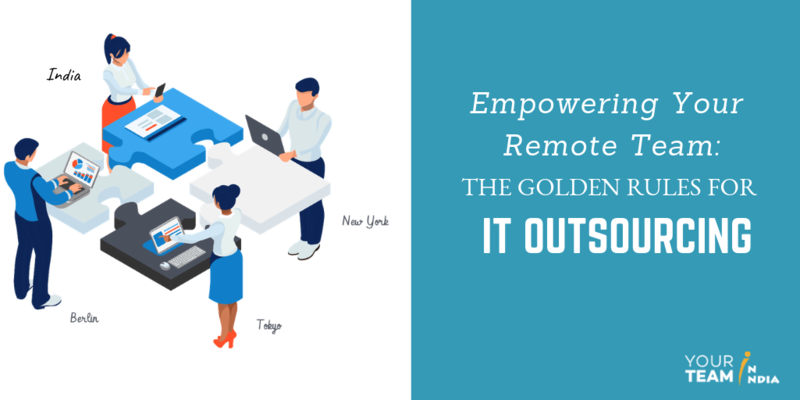 Sometimes CTOs have to face cultural obstacles while managing their remote teams. It becomes a challenge to manage people of different races. The best thing to do is to embrace cultural diversity allowing to team building. Evaluate how different people from different areas are open to receive feedback. Be respectful about the national holidays and respect the cultural differences. A company must help its employees to pursue their interests. It will help in having more productive employees than the one focused on work and assignments only. History proves that the biggest minds are open to all kinds of co-curricular activities. Be it, Newton or Einstein, everyone was proficient in some art. A company might assign a particular day every month for personality development. It is easy for the company to focus on in-house employees. But taking care of remote developers is a challenging task. If a remote worker masters an extra skill, it will only help him to deliver the task within a remarkable time. Gone are those days when the employee used to focus on his salary only. Nowadays, it is more about job satisfaction and internal peace that a person seeks while working. Some tools lets other person see exactly what the other person is doing. They also allow people to control the system remotely. Many tools are free to use like TeamViewer and Join.me. Skype, Slack and Google Hangouts also gives the opportunity to share screening and control the computer remotely. Take time to think strategically about different challenges you are facing and create a good plan to address them. Pay close attention to the above mention strategies and you can quickly get up to speed. Managing remote team is as easy as managing your in-house team provided you put in place the right process.